The Cougar Paws Performance Roof Boot is a workhorse that offers durability, comfort and style. 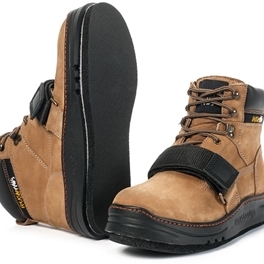 This 6 inch roofer boot has a soft flexible leather upper with a cushioned interior lining that results in a snug comfortable feel. The redesigned outsole provides a more balanced fit, reducing foot fatigue. Additional Roofing Pads sold separately. This boot is a workhorse that offers durability, comfort and style. This 6"boot has a soft flexible leather upper with a cushioned interior lining that results in a snug comfortable feel. The redesigned outsole provides a more balanced fit, reducing foot fatigue. Additional Peak Line Pads sold separately. This Roof Boot provides performance on shingles, plywood, wood shakes, felt and slate. The Performance Roof boot use Peak Line Replacement Roofing Soles. It is not available in � size large. Please order your normal shoe size.